Good morning and welcome back to another posting of Thibeau Time. Today's entry is going to be about this blog; more specifically I want to share with you some of my thoughts on my blog up until this point, what it means to me and how I feel about its future. When I started this blog, my intention was not to become famous; it was not to become rich; it was not to impress. No. I started my blog with the sole express purpose of sharing information with others. I wanted to share my stories, my philosophies, my ideas, my observations. I wanted to share with people, as many as possible, who I was, who I am and who I want to be. Most importantly I wanted a place to get some of these thoughts inside my head out where they would be recorded and archived. Initially I was overconfident about the prospects of blog writing. I expected that I would have endless amounts to say, discuss or explain. After all, for those who know me in real life, I do enjoy discussion, debating and story-telling. Sharing with others is one of the best ways to gain new knowledge and information about things we know little about or even better, things we thought we knew everything about. One of my hopes was to bring that to you through my experiences. As it turns out, writing and maintaining a blog requires a certain level of discipline and dedication I had underestimated. In spite of all the things I thought I would have to say, often times it takes nearly 30 minutes of thought to come up with a reasonable topic for discussion. Writing a blog is real work. As my blog has progressed, so has my writing skill. I have learned new ways of writing that had been previously hidden from me. I've learned to use different forms of sentence structure; increased the level and size of my vocabulary as I search for new and innovative ways to convey my messages. I have also developed; as a person. Each day, I write my blog post entry fresh. Most days I have no pre-disposed ideas on a particular topic to write about. Some days I am inspired by news; other days by experiences I've gone through; and still other days it is something else. I am never certain where my inspiration will stem from; only confident that it will manifest itself. As I proof read each blog entry, I get to go back, read and return to the experience in question. Each time I do, I learn a little something about myself that I never quite understood before. Blogging has helped me to become a more complete individual and has helped me to discover myself. This blog has quickly become an important part of my day to day life. I learn, I grow and most importantly, I share. That, in the end, is what I really enjoy about my blog. Seeing who and where people are reading my blog. 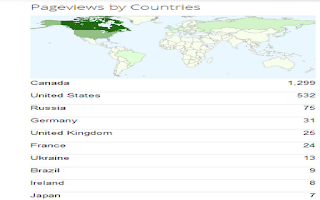 There is a statistics page where I get to go and see what countries people are viewing my posts from; when they are viewing them; how they are viewing them; what posts they are viewing; all kinds of really interesting numbers. I get this feeling similar to that of a child on Christmas each time I check in to see where people are viewing my blog from and how many. I must admit that it is a truly amazing feeling to log in and see people from Russia, South Africa, Australia, United Kingdom, Germany France, Netherlands and so many more foreign countries (foreign to me) whose citizens are taking time out of their day to read the humble words of a little, unknown Canadian kid. Truly a great feeling. So today I have come to realize just how important this blog is; especially to me. It provides me with an outlet for my thoughts and emotions; it connects me to thousands of different people, not just in my own country, but from around the world; it helps me to understand myself and to grow as an individual; and it helps to inspire and teach others. There have been many things that I have undertaken in my time; many projects started and left unfinished; too many ideas only half-started and forgotten; this will not be the same fate for this blog. It means too much, provides too much, to you and others; but most importantly to me.